In the Netherlands, I was assigned to create an outdoor sculpture dealing with themes of renewable energy in relation to the farm-based economy of the island I was on. I chose to work with the theme of the Ouroboros, an ancient symbol of cyclicality expressed by a serpent devouring its tail. I found out that the island itself is gradually shifting eastward each year as currents move sand from the western shore and deposit it on the eastern end. In this way the island is “devouring its own tail.” I represented this in a large sculpture of a snake constructed of antique Dutch roofing tiles that is slithering through the grass to form the shape of the island. The snake’s head points east toward his tail, where it departs from an unfinished roof. Suspended by a cord tied to a tree, it is animated when the wind blows. 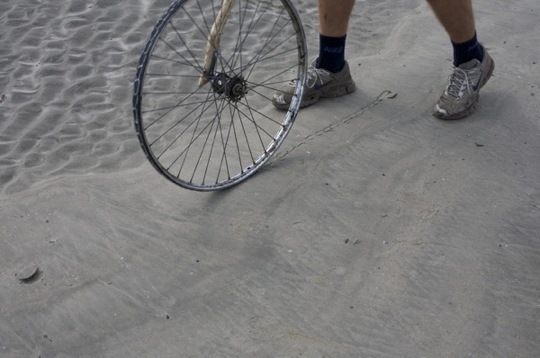 A performative part of the project involved a drawing device built from a bike wheel that printed the image of the Ouroboros either with ink or in the sand. As I walked along the beach from the western to eastern shores, I traced the path of the sand’s migration.